LOMA LINDA, Calif. --- Nutritionists at Loma Linda University have unveiled the latest in "biblically-inspired eating for optimal health." The new diet consists of roasted (not fried) locusts and copious amounts of wild honey. Loma Linda spokesperson Lieter Alist said that the secret to John the Baptist's effectiveness as preacher was directly tied to the simple genius in his diet. Alist stressed that vegetarian Adventists were completely safe making an exception to their dietary restrictions in the case of locusts. 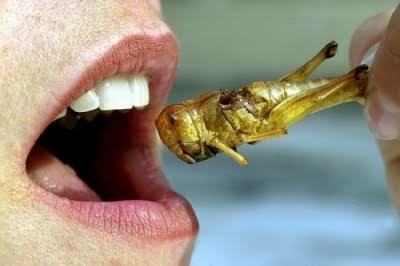 "If you aren't a huge fan of the taste of grasshoppers just add more honey," said Alist who added that honey worked as an effective lubricant that could facilitate smooth consumption of the insects. Alist said that a side benefit of the locusts and wild honey was weight loss as "over-consumption while on the diet is highly unlikely." So if you’re a literalist, go get some of that yummy carob. Even Jim Comey likes it. He pigs out on it while patrolling the Walla Walla college campus. You gotta have a stomach lined with cast iron to digest this stuff. As for me and my house, gimme all the Little Debbies you can stuff into a UPS truck and delivered to my house ASAP. Yuck! to all that bug stuff.